Robomow, as its name would suggest, is a company organised to design and make robotic lawnmowers and nothing else. So, unlike other brands, there are no distractions or reasons to hold back on innovation. We’re hugely interested in new automatous robotic technologies and, according to the latest consumer studies, the subject is gaining serious interest among homeowners. We’ve been fortunate to test the Robomow RC304 robotic lawnmower this summer to see if this one-track minded focus of the brand pays off? Highlights include; claimed unbeatable efficiency, edge cutting, App integration and range capabilities of 0-400m² lawns. Robotic lawnmowers all seem to share similar designs whilst utilising different colour schemes, and whilst we think the green Robomow may be the copied rather than the copier, from all our testing it’s indisputable that it’s a shape (63 x 46 x 21cm) that works in and amongst various lawn layouts - thus becoming the shape of choice for most brands within this category. The build quality is suitably robust for it to be an outdoors all-year workhorse. Hard plastics on both the mower and base station keep it in good shape. Downsides include the glossy exterior surface that washes well in the rain but does reveal scratches from grazing against hedging and overhanging branches. This is an issue the matt plastic Flymo 1200R robotic lawnmower hasn't suffered. The Robomow does have a specific design difference on its left side, where there’s a protruding edge for the ‘cut-beyond-the-wheel’ - or edge cutting - something we’ve not yet seen before on a robotic mower. Furthermore, Robomow have ingeniously implemented a modular component design to manufacture the mower (think Lego) and what this means is if a part stops working it can be self repaired, saving expense and time. The 11.1kg mass is quite hefty to carry about if you have more than one lawn area, but if you just have the one you’ll not likely make physical contact with the mower over the many cutting months. When we flip the mower over we find a few things on the Robomow RC304 that seriously challenge the previously reviewed Flymo robotic 1200R lawnmower. It has a dramatically more substantial blade design for one thing; we say this because the Flymo has what appear to be three Stanley blades on screws that spin in order to cut the grass, and although this design is very effective for regular mowing, the Robomow does prove, as we reveal in performance testing later, that it’s more flexible with grass length due to its 28cm triangular shaped solid blade design. Conversely, underneath the mower also reveals one of the strangest design inclusions, although it’s not necessarily anything cumbersome if your memory is sharp: The height adjustment relies on a large plastic screw and it’s the kind of the thing households could easily misplace - we’d prefer the cutting height to be adjustable totally on the mower itself. An invitation for a professional installer to set up everything for you (an extra £250) or a DIY method are available. We opted for the DIY route on our 140m² test lawn, which turned out to be a bit quicker to set up than the Flymo 1200R, albeit it was a near identical process. The first step is to peg a guide around the proximity of your lawn and around obstacles like flowerbeds. This builds virtual walls where the mower will not cross, although it will overlap to achieve edging and therefore measurements of how far away the wire should be from a pathway or a wall are different. Robomow have incorporated a service onto their website whereby you can actually measure the area of your lawn(s) via satellite imagery to compound the square metres. This is helpful because the Robomow models range is differentiated by the amount of square metres they’re prepared to cut. Once the wire (took us 15 minutes) is pegged, the charging base needs to be pegged into the ground where the end and beginning of the guide wire meet within a screw-based connector. Unlike the Flymo method, there’s no separate wiring to lead the mower back to the base, but instead this function is just part of the entire circuit, saving set-up time and making the lawn look smarter too, we think. To make the ultimate use of the functionality of the Robomow you’ll want to have an iOS or Android device in order to use the free Robomow App. We were hugely impressed with the design and all the encompassing functionality, like push notifications of mower status, that the App presents. So much so we never used the onboard mower buttons/display beyond the first set-up to establish the date and time. So what can the App do? Well, of course, you can begin edging mode or regular smart-mow mode; schedule mowing; see battery life; specify area size; set an alarm; trigger eco mode and see the percentage of mowing progress - but it’s when we discovered the ability to control the Robomow via a virtual remote, like we would an RC car, that we realised the huge potential it had in being a traditional lawnmower replacement. We could spot mow tiny areas with ease, without the need to set up a guide wire. We did actually attempt to mow in straight lines on a large lawn, and whilst it basically worked, the lack of speed in forward movement made it pointless and, of course, it negates the whole purpose of the product. Nevertheless, for smaller areas this control is an indispensable feature companion. The App also allows the user to dive into the finer settings, like how far away the mower should overlap the boundary wire or if turbo-mode should be toggled. As we peak into the heart of summer our 140m² test lawn shows no signs of slowing down in growth. With plenty of rain and a somewhat limited amount of sunshine during this typical British summertime, our grass has been growing like mad (1cm a day) and really should be cut daily. However, heavy rain has prevented this daily cut because the mower detects rainfall and returns to its base - only with the best of intentions, of course, to stop things getting messy. During the Robomow’s first cut the grass was exceeding 12cm in height and through the App we set the mower into turbo-mode. The motor did, on occasion, just totally give up and we suspect this is an overloading motor prevention; but with the sporadic approach the lawnmower takes to mow over the same areas at different angles, the lawn was eventually completely cut and it didn’t yank any grass out when we inspected the finished outcome. Even given this extreme scenario it cuts the grass finely, and we have seen that the trimmings that do remain on the surface after the first pass are driven over repeatedly for all clippings to end up deposited for mulching low down within the grass roots. We have subsequently invited the Robomow to cut our lawn on a schedule every 2-3 days, to leave a length of 4.5cm (cutting height adjustment ranges from 15-60mm), and we’ve learnt a lot. The difference in cut and traction over slopes and uneven surfaces between the Robomow and Flymo 1200R is relatively minute. The grass is left flat and even, and there aren't any lines; instead the grass is just one uniformly cut surface. 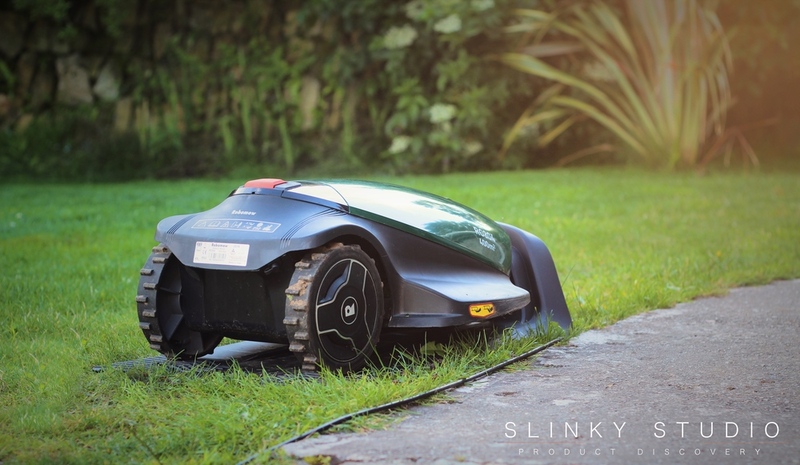 Really the Robomow is a mulching dream-machine that effectively feeds lawns with trimmings and has regular mowing married on - lawns will look strong and green without any hands-on maintenance, like our test lawn shows! Furthermore, the edging mode is one of the Robomow’s big unique selling points: With the press of a button on either the mower or App it will take off and repeatedly cut the extremity of our lawn - and it does work. We’ve had to adjust the wiring to get a close-to-the-edge cut in areas, but mostly it (don’t throw away your tiny shears) cuts grass at the edge far better than the Flymo does. But there are some objective comparisons to talk about. The most obvious is with our regular mowing, as previously outlined, where it gets the job done in around a whizzy 25 minutes - which brings the battery down to 50% from fully charged. The Flymo takes around 45 minutes to cut our 140m² test lawn. There are three facets as to why the Robomow RC304 is so much quicker; the first is that the wheels travel faster, then there’s the stronger triangular blade design, and finally the 200w motor spinning it. This does lead to a noisier (64-67.9 DB) mower over the dainty sounding Flymo, but for larger lawns that make full use of the 400m² capabilities of the RC304 model, the sprightly cut means more time enjoying your lawns and better battery efficiency; although if the mower does run out of juice midway, it will return to the base and then recharge to finish off. The Robomow RC304 is certainly the best robotic lawnmower we’ve seen for domestic use. In fact, it’s one of the most feature rich robotic automatous product experiences we’ve shared yet, thanks to the genuinely useful deep App integration. It cuts grass, short or tall, with no issues and removes the necessity for the complimentary accompanying traditional lawnmower ownership, thanks to the App supporting virtual remote control functionality in smaller areas outside the boundary wire.